A double dose of raspberry jam—spread over the baked brownies and mixed into the rich truffle topping—makes these brownies extra special. Preheat oven to 350°F. Line 13x9-inch baking pan with foil, with ends of foil extending over sides of pan. Grease foil; set aside. Microwave 4 oz. of the unsweetened chocolate and the butter in large microwaveable bowl on HIGH 2 min. or until butter is melted. Stir until chocolate is completely melted. Add sugar; mix well. Blend in eggs and vanilla. Stir in flour and nuts until well blended. Spread in prepared pan. Bake 30 to 35 min. or until toothpick inserted in center comes out with fudgy crumbs. (Do not overbake.) Cool in pan. Spread 1/4 cup of the jam over brownies. Chop remaining 2 oz. unsweetened chocolate and the 6 oz. semi-sweet chocolate; set aside. Microwave cream in medium microwaveable bowl on HIGH 1 min. or just until cream comes to boil. 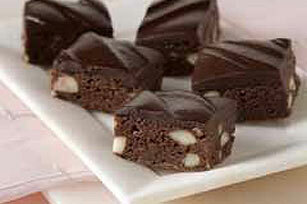 Add chopped chocolates and the remaining 3 Tbsp. jam; stir until chocolates are completely melted and mixture is well blended. Spread over jam layer on brownies. Refrigerate 1 hour or until chocolate glaze is firm. Lift brownies out of pan onto cutting board, using foil handles. Cut into 32 pieces. If baking in glass baking dish, reduce oven temperature to 325°F. Bake and glaze brownies as directed. Remove from pan; cut into diamond-shaped bars. Garnish each bar with a fresh raspberry just before serving.